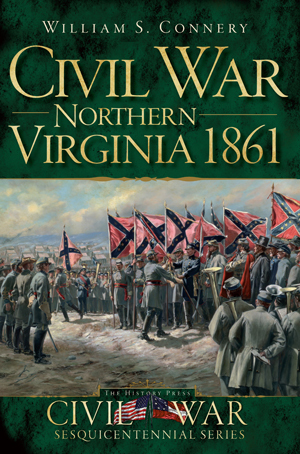 Civil War: Northern Virginia, 1861, Williams S. Connery, History Press, 160pp, 48 b/w photographs and illustrations, 3 maps, index, bibliography, 2011, $19.99. William S. Connery's Civil War: Northern Virginia, 1861, offers interesting and enlightening stories in three crucial Confederate counties. Loudoun County with Leesburg, Fairfax County with Arlington and Alexandria and Prince William County with Manassas have a remarkable Civil War history. Within a horseback ride from Washington, D.C. these three counties contained both Confederate patriots and Union loyalists. Appropriately, Connery begins with an event July 4 1860 in Occoquan, Prince William County. A rally of Unionists celebrated the nomination of Lincoln; citizens of Fairfax County muster the militia, asked the governor for permission to suppress the flagpole with its Republican presidential campaign flag. Connery highlights the characters who will be heard from again, such as James Jackson, a proprietor of an Alexandria hotel in which he and Elmer Ellsworth will die within a few months. Stories include: Lee at Arlington, the seizure of Alexandria, and the fate of Washington's Mount Vernon estate. Civil War firsts are introduced: first Confederate wounded and first killed in combat, the first destruction of a troop train, the first balloon reconnaissance, and the first exclusively military railroad. Battles are not neglected: Manassas, Ball's Bluff and Dranesville. The Potomac River blockade, the first exchange of cannon fire between Union navy gunboats and Confederate shore batteries at Battle of Aquia Creek are well described. Connery frequently offers the incidents in the participants own words such as Barksdale's [Mississippi] and Deven's [Massachusetts] official reports the fight at Ball's Bluff. Connery has recently received recognition from the United Daughters of the Confederacy for his study, research, writing and public speaking and preservation of Confederate history. Civil War: Northern Virginia, 1861 is accessible to high school readers and will be enjoyable for all history enthusiasts. Interactive Map: Where Were Gettysburg's Battlefield Dead Buried? The Elliott Map is a map of the battlefield of Gettysburg made from an accurate survey of the ground by transit and chain by S. G. Elliott and Company. Dated June 10, 1864, this map shows the locations of Union and Confederate burials, dead horses, breastworks, lunettes for artillery, and rifle pits, borough and farm buildings, as well as topographical features. Although the information appears impressive, a modern day research by historians and battlefield guides argues that the number of burials shown on the map [in particular in the Rose Farm area] are much less in number than what actually exists. The Library of Congress has an online and interactive Elliot Map. This link will bring you to the LOC map. Once you have the map on screen you can zoom in and out and scroll around the map by using the computer's mouse wheel. The Battle of Gettysburg Resource Center has a online compendium of historic and contemporary maps. Here is the link. Civil War Nursing, an online exhibition, is jointly produced by the Smithsonian's National Museum of American History and the National Library of Medicine. So Much Need of Service focuses upon the diary of Amanda Akin, a Civil War nurse and the photographic collection of fellow nurse, Anna Lowell. Also included are issues of a era newspaper entitled the Armory Square Gazette that was authored, printed and distributed by the hospital's staff. There is an interactive map with pins on the locations mentioned by Akin; included are 'then and now' picutures. The photograph above is of the Armory Square Hospital. Here is the link to the exhibit. The Atlantic magazine is offering online 98 Civil War digitally enhanced photographs from the National Archives. The Atlantic reports "Last year marked the 150th anniversary of the start of the American Civil War, a milestone commemorated by The Atlantic in a special issue. Although photography was still in its infancy, war correspondents produced thousands of images, bringing the harsh realities of the frontlines to those on the home front in a new and visceral way. As brother fought brother and the nation's future grew uncertain, the public appetite for information was fed by these images. " " part 1 of 3, covering the places of the Civil War: the battleships, prisons, hospitals, urban centers, and rural pastures where history was made. . . ." " . 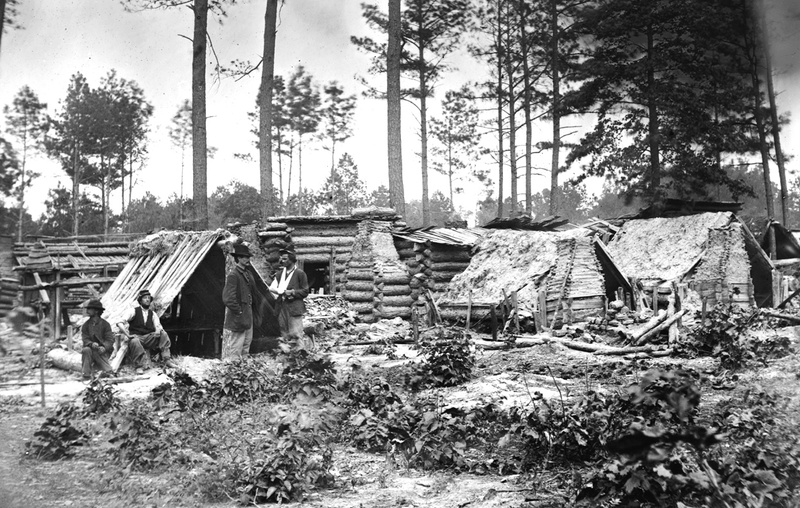 . . part 2 of 3, covering the people of the Civil War: the generals, slaves, civilians, politicians, and soldiers that lived through those turbulent years. Keep in mind, as you view these photographs, that they were taken 150 years ago -- providing a glimpse of a United States that was only 85 years old at the time. " Some viewers note that some of captions may be misleading or incorrect. 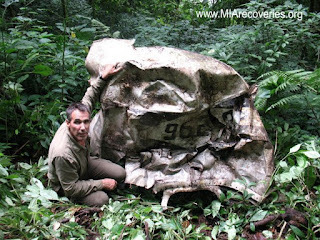 Off Topic---Professional Adventurer Finds Hundreds of WW2 USAF Crash Sites In Mountains: Hunting For Hero Fliers From Lost Era, Fox News, May 30, 2012. Nothing James Browne learned in flight school prepared him for “The Hump,” a perilous, Himalayan no-man’s land that became a graveyard for hundreds of fearless WWII-era fliers who battled Japanese fighters, impossible weather and a supply route from hell. Just 21 years old on Nov. 17, 1942, when he took the co-pilot’s seat of a C-47 bound for Dinjan, India, from Kunming, China, Browne was one of hundreds of fearless American fliers who took the infamous supply route over the Himalayas, ferrying supplies to China as it battled Imperial Japan. Browne, like many others, had signed on before the U.S. entered the war that was rapidly engulfing the globe. "I find a lot of shoes." Somewhere high above the Himalayas, the aircraft’s wings iced over. The best guess is that it stalled out and dropped like a rock, landing in the rugged mountain jungle, its location a mystery that would endure for more than 70 years. Browne, who grew up in the Chicago suburb of Winnetka, Capt. John Dean, the pilot and a veteran of the legendary Flying Tigers, and a Chinese crewman were listed as missing in action. The plane was one of hundreds to go down in the rugged and remote mountain region fliers dubbed “The Hump” by American fliers who dodged Japanese fighter planes, steering their unarmed and rickety aircraft for 20-hour stretches with unreliable instruments in winds that could reach 200 mph. Experts believe more than 700 planes crashed trying to surmount the Hump, making the Himalayan region an inaccessible tomb of legendary fliers and rusted fuselages. Other names earned by the dangerous route, from northeastern India, over Burma and into western China, included “Skyway to Hell” and “Aluminum Trail,” both testament to the hazardous path and the courage of the men who flew it. "I'm so impressed by the sheer courage of those Hump airmen, flying their almost suicidal missions over the Himalayas, while knowing all the time that the odds were heavily against their safe return," said Clayton Kuhles, a self-described “professional adventurer” from Arizona who has made it his cause to seek out crash sites and bring closure to the families of the lost fliers. "In fact, many of their buddies never did return, but simply vanished up there in those rugged and remote mountains," he added. "They were good men." In eight separate trips, Kuhles has located 22 crash sites and helped account for some 193 U.S. airmen once classified as missing in action. Kuhles, 58, an avid mountaineer, was in India in 2002 when he first heard of old crash sites in the treacherous mountains. His guide mentioned in passing that he had heard of a plane wreck buried in the jungle. “He could’ve been B.S.ing me in hopes of racking up a few extra days of guide fees but, in my gut, I knew he was probably telling the truth,” recalled Kuhles. The tale intrigued Kuhles, and launched him on a crusade he says has already cost him $100,000 of his own money. Sometimes, the only sign of crew left in the tangled metal is a dogtag, a few scattered bones or the garments worn by long-dead pilots and crewmen. “I find a lot of shoes,” Kuhles said. A Blaze of Glory: A Novel of the Battle of Shiloh, Jeff Shaara,Ballantine Books, 464 pages, $28.00. 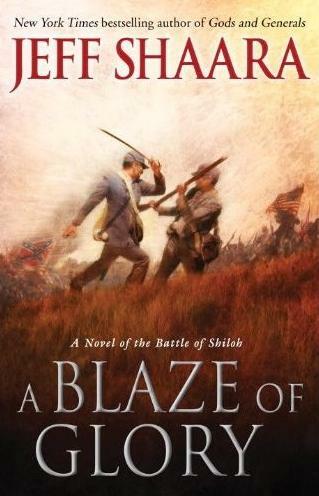 From the publisher: In the first novel of a spellbinding new trilogy, New York Times bestselling author Jeff Shaara returns to the Civil War terrain he knows best. A Blaze of Glory takes us to the action-packed Western Theater for a vivid re-creation of one of the war’s bloodiest and most iconic engagements—the Battle of Shiloh. It’s the spring of 1862. The Confederate Army in the West teeters on the brink of collapse following the catastrophic loss of Fort Donelson. Commanding general Albert Sidney Johnston is forced to pull up stakes, abandon the critical city of Nashville, and rally his troops in defense of the Memphis and Charleston Railroad. Hot on Johnston’s trail are two of the Union’s best generals: the relentless Ulysses Grant, fresh off his career-making victory at Fort Donelson, and Don Carlos Buell. If their combined forces can crush Johnston’s army and capture the railroad, the war in the West likely will be over. There’s just one problem: Johnston knows of the Union plans, and is poised to launch an audacious surprise attack on Grant’s encampment—a small settlement in southwestern Tennessee anchored by a humble church named Shiloh. With stunning you-are-there immediacy, Shaara takes us inside the maelstrom of Shiloh as no novelist has before. Drawing on meticulous research, he dramatizes the key actions and decisions of the commanders on both sides: Johnston, Grant, Sherman, Beauregard, and the illustrious Colonel Nathan Bedford Forrest. Here too are the thoughts and voices of the junior officers, conscripts, and enlisted men who gave their all for the cause, among them Confederate cavalry lieutenant James Seeley and Private Fritz “Dutchie” Bauer of the 16th Wisconsin Regiment—brave participants in a pitched back-and-forth battle whose casualty count would far surpass anything the American public had yet seen in this war. By the end of the first day of fighting, as Grant’s bedraggled forces regroup for could be their last stand, two major events—both totally unexpected—will turn the tide of the battle and perhaps the war itself. 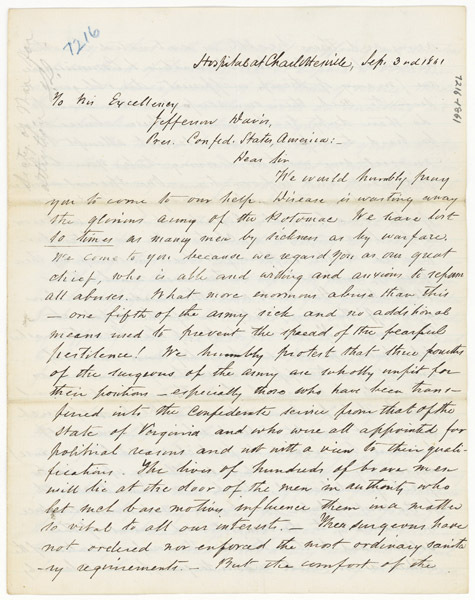 The Archives I Reference Section is pleased to announce our in-house digitization project in honor of the Civil War sesquicentennial. During the course of the next five years or so, the 2,750 volumes comprising the Collected Record Books of Various Executive, Legislative, and Judicial Offices of the Confederate States of America, 1860-1865, will be digitized and uploaded in batches to the Archival Research Catalog (ARC). Each volume will have its own unique ARC Identifier Number. These record books, part of Record Group [RG] 109, War Department Collection of Confederate Records, are a significant collection of records encompassing nearly all aspects of the Confederate Government and military. These records, which were created by various elements of the Confederate States during the Civil War, came into the custody of the U.S. War Department during and at the end of the war by capture or surrender. A significant portion was captured along with Jefferson Davis and his cabinet. In the post-war years, the U.S. War Department added to their collection of Confederate records through purchase or donation by private individuals throughout the South. Between 1874 and 1898, the records were in the physical custody of the Archive Office as well as the Record and Pension Office of the Adjutant General’s Office. During this period, the Confederate records were cataloged and organized. They were heavily used as part of the publication of the Official Records of the Union and Confederate Armies, and were consulted and transcribed as part of the creation of both the Union and Confederate compiled military service records. The War Department transferred their Confederate records to the National Archives in 1938. NARA rebound the Collected Record Books, but still maintains the “chapter volume” arrangement. Within RG 109, the Collected Record Books are the most heavily used series, and are requested by historians, genealogists, and Civil War preservationists on a regular basis. They are also perhaps the most interesting, not only because of the wide range of information they contain, but in their wide physical variety – an assortment of shapes, weights, paper color and paper type prevail throughout the collection. Digitization of the Collected Record Books is a collaborative venture, with multiple offices at both Archives I and Archives II working together to accomplish this ambitious effort. The “chapter-volume” team consists of staff from the following offices: Archival Operations – Washington, DC (RD-DC); Conservation Branch (RXC); Digitization Services Branch (IDS); and Online Public Access Branch (IOO). DeAnne Blanton, RD-DC (AI), is Project Lead. 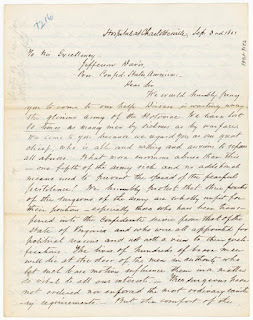 Image Source: Confederate Hospital Patients Letter to President Davis.